JTB FlexReport is JTB World’s license monitoring and reporting system supporting among others FlexNet (FLEXlm), Sentinel, RLM, LM-X and other license systems. JTB FlexReport web report demo is now available to try in beta version. Visit http://jtbflexreportdemo.jtbworld.com/ to try the web report demo. Note the dates for available data to report on. 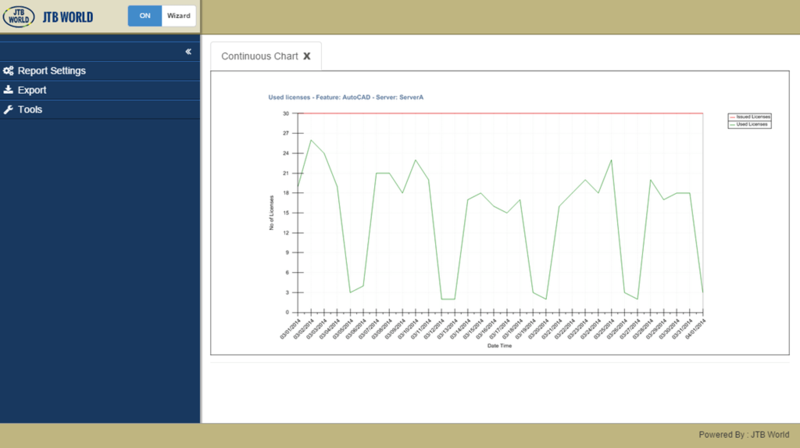 To learn more about the reports and functionality see the Chart Client documentation. It works pretty much like the current Chart Client but gives the option to run reports in a web browser and it’s hopefully easier to get started with thanks to the wizard that is activated by default. It also works on mobile devices. Soon it will be made available for customers to set up in their own environment and with their own database. Please contact us if you run into any issues or have any comments on this functionality. Example of usage: Start with Report Settings and select the Report Type you like to use as well as Date Range and some other settings. Scroll down and click on Next. If Continuous Line Report Type is selected you have two choices, Feature Server or Detailed. Use Feature Server if you want to select only Features, Servers or groups of them. To also select Hosts, Users and groups of them select Detailed. See more about JTB FlexReport here.